Last week, both the Texas Senate and House of Representative introduced legislation (SB 680 & HB 1464) that will curb step therapy protocols. In an effort to ensure the passage of the important legislation, NPF and the Multiple Sclerosis (MS) Society hosted the 2017 Texas Step Therapy Lobby Day. On Wednesday, Feb. 1, 18 NPF patients, providers, staff and Board members joined MS Society advocates for our 2017 Texas Step Therapy Lobby Day. The event’s goal is to educate Texas state officials on the impact of step therapy and “fail first” insurance policies, and to endorse our 2017 step therapy legislation. Events kicked-off with an issue training and dinner the evening of Tuesday, Jan. 31. The robust discussion and networking opportunity left our advocates well informed and eager to meet with their legislators about the importance of curbing step therapy. A press conference with our two bill sponsors, Senator Kelly Hancock and Representative Greg Bonnen, as well as NPF Board of Directors Chair Colby Evans, M.D., started our Wednesday Lobby Day activities. Following a quick training refresher and lunch at the Capitol, our advocates organized into six separate groups to meet with a total of 25 legislators and/or their staff. In additional to scheduled meetings, NPF groups dropped off packets of materials to 37 separate legislator offices—many of which resulted in sit-down meetings. We are very excited to include Texas leadership as part of these 62 direct outreach efforts. 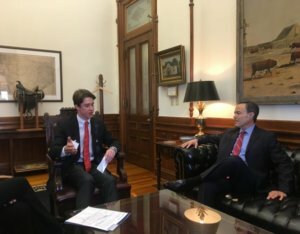 Junior Ambassador Michael Wood (shown above), along with his mother, Jodi Wood, led meetings with Lieutenant Governor Dan Patrick and Speaker of the House Joe Straus. NPF President and CEO Randy Beranek and Director of State Government Relations Patrick Stone led a meeting with the staff of Governor Greg Abbott. Going forward we will continue to keep an open dialogue with these offices and continue growing new relationships that will allow us to encourage the successful passage of step therapy bills SB 680 and HB 1464. Ready to help support our efforts to reduce step therapy in your state? Please contact our State Government Relations Manager, Amy Prentice, at aprentice@psoriasis.org to learn how you can get involved! PreviousPrevious post:NPF wraps up successful step therapy lobby day in OhioNextNext post:Sick of Step Therapy? So are we!